Learning to be a doctor can be — to put it mildly — stressful. Medical students face unrelenting pressure with so much to learn, intense competition, long days, and sleepless nights fueled by fast food and cafecitos. At the University of Miami Miller School of Medicine, Student Wellness Week aims to equip future doctors with coping strategies for the stress and self-doubt they encounter during four grueling years of medical school. Organized by the Wellness Advisory Council, which is chaired by Andrew Stine-Rowe, a third-year M.D./MPH student, and Madeline Cohen, a second-year M.D. 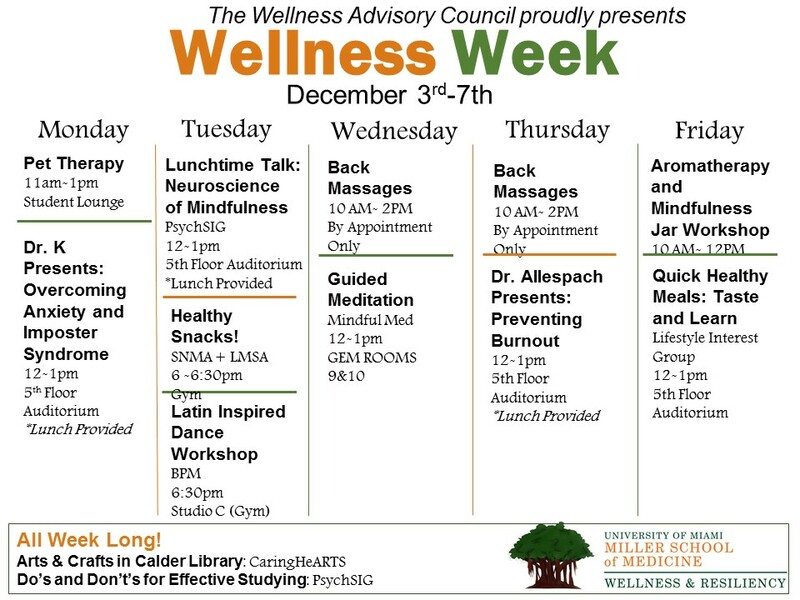 student, Student Wellness Week is now in its second year. It kicked off December 3 with an hour-long pet therapy session in the Student Lounge of the Rosenstiel Medical Sciences Building. Close to three dozen students, many of whom had just come from an exam, gathered for a meet-and-greet with a trio of four-legged therapists. The stress visibly evaporated from students’ faces as they petted and played with Passion, a small black Shih Tzu; Sparky, a scruffy, gray Schnauzer mix; and Wesley, a massive, 170-pound, black and white Great Dane. Therapy dogs are always a popular draw, said Taylor, who majored in psychology as an undergraduate and believes that social, physical, and mental wellness need to be emphasized as part of the medical school curriculum. 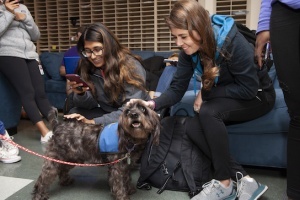 “Pet therapy is an excellent way for students to relax, have some fun, and take their minds off the stress of school for a little while,” she said. Staying fit and maintaining healthy eating habits is also an important part of student health and wellness, according to Karhu, who is also part of the lifestyle medicine interest group that will be serving up quick and healthy recipes tailored to student budgets. The pet therapy session was followed by a lunchtime talk featuring Addys Karunaratne, Ph.D., a staff psychologist with the University of Miami Counseling Center who spends four days a week on the Miller School campus counseling medical students. To combat the stress of medical school, Dr. Karunaratne says students can take advantage of individual and group counseling that teaches them how to foster self-compassion and use mindfulness and cognitive behavior therapy to manage anxious feelings and challenge negative thoughts. Hilit F. Mechaber, M.D. ’95, associate professor of medicine and associate dean for student services, serves as an advisor to the Wellness Advisory Council and is an enthusiastic proponent of Student Wellness Week. For more information about Student Wellness Week, click here.